Taking a year off to travel right after university sounds like a dream, but many people struggle with the idea of explaining a gap on their resume. Dealing with a variety of schedule disruptions while travelling can teach you how to be creative and resourceful. Staying calm while dealing with transportation issues, cancelled reservations and border guards shows you can think on your feet, adjust and prioritize when things go wrong. This proves you can to adapt to change when needed, and to step up and get things done when things don’t go as planned. With so many labels and set prices determining the passivity of Western culture’s consumer habits, many people are not familiar with how to handle a simple negotiation. If you’ve travelled outside of Europe or North America, you’ve most likely learned the art of bartering for goods and services. You’ve learned how to read when you’re being played, and you know how to put your foot down and walk away when things aren’t going your way. This ability is an asset to any business that frequently makes deals, and being able to say that you’re an expert negotiator with firsthand experience is something that most of your less worldly competitors won’t have. The instability of scheduling when travelling internationally teaches you to manage your time effectively. You’ve might have learned to arrive early for everything, to fit in eating and restroom breaks when you get a chance and to keep a running list in your head of things that you need to fit into your schedule before the next major checkpoint. 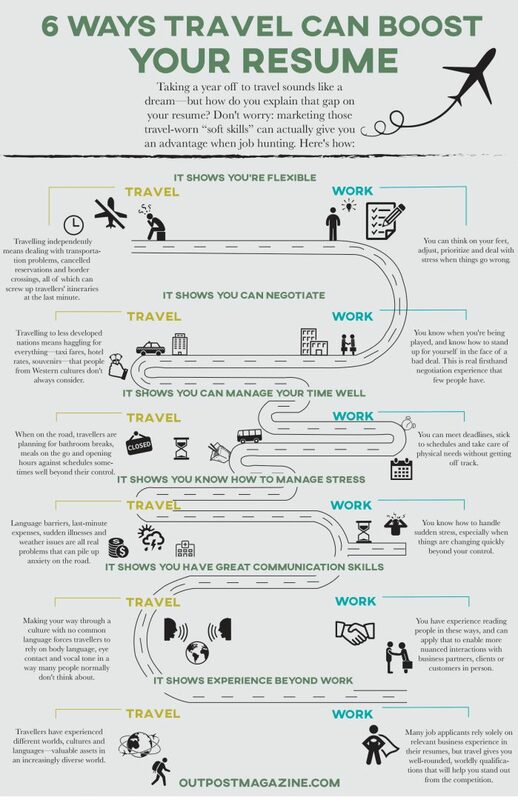 Having travelled extensively shows potential employers that you can meet deadlines, stick to schedules and take care of your physical needs without getting off track. When most people think of travelling, they conjure images of relaxing on a beach and visiting museums. If you’ve travelled, particularly outside of the Western world, you know that travel can bring a whole series of problems: language barriers, last-minute expenses, illness, rapidly changing transport plans and weather problems can all add up to a level of stress many people never experience. This kind of travel experience shows that you can keep your head up and stick it out, even when things get tough. One of the undervalued skills in the business world today is that of understanding the non-verbal communication of body language, tone and eye contact. As we transition into a world where so much is communicated through text and pictures online, the ability to walk into a room and read people is invaluable to many businesses. If you managed to navigate your way through a culture where you didn’t speak the language, but still effectively communicated your needs anyway—or even managed to pick up some foreign words—you have a gift that is missing from many boardrooms and meetings today. Whether you have previous employment experience or not, being able to call on your experiences of travelling the world is an asset to any employer. Don’t let the potential of having an employment gap in your resume keep you from a once-in-a-lifetime learning opportunity—it could help in more ways than you, or any hiring committee, actually realized. The 3 Seasons of Travel: When it’s Best, and NOT Best, to Go!